Educational Qualification : Passed 10th, 12th, Graduation in any Discipline with minimum 60% Marks Throughout. 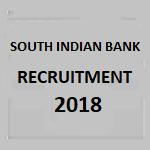 Eligible Candidates can Submit Application at the Official Website of South Indian Bank latest by 27th June 2018. Applicants First Logon to South Indian Bank Official Website. Click on Recruitment of Probationary Officers through PGDBF Programme Link. Open & Read Notification and Check Eligibility Details. Pay Application Fee & Upload Scan Photograph and Signature.